This hot, humid summer is really getting to me. I feel trapped... When you walk outside, this oppressive wave of humidity just hits you like a brick wall. It's so heavy. I can't even enjoy summer because the air is so thick and sticky feeling. It's making me sad. So... I'm trying to imagine fall. Cooler days, beautiful colors, no more humid 95 degree days... Fall makes me happy and so does this polish. Revlon Khaki Zing. This one is, sadly, discontinued and long gone. There are similar colors (Zoya Ki comes to mind) and you can still occasionally find this in dollar stores and places with old stock. The base color is a smoky silver grey overlaid with dusty blue-toned purple. When you move your fingers, the polish flashes many different colors. Red/orange, darker purple, green, and a little yellow-gold. It has a bit of a streaky, frosty finish but the color is so beautiful, I don't mind it. The formula on this one isn't as runny as Revlons tend to be- this is three easy coats. I miss these old duochromes. Wish some brand would come along with an accessible (not online-only), reasonably priced collection of dramatic multichromatic polishes. That would be nice. This polish is lovely! Shame it's discontinued. How does it compare to Wet n' Wild's "Gray's Anatomy" Fast Dry Nail Color? Kind of reminds me also of Nubar's Purple Beach. NeutraKis, much better than Gray's Anatomy! This isn't sheer, watery or as frosty and has a lot more duochrome. It's darker, too. All around great polish. Ooh, this color is breathtaking! I'm sad to hear it's discontinued. Totally agree about this summer... been so humid = DAMP that I feel chilled to the bone when I go back indoors... a non-humid but colder Fall day is preferable, even though I'm a hot weather lover. LOVE!! You need to collect the rest of the zings too! The world definitely needs more duochromes like this! Fall is coming, I promise. I'm so sick of this heat as well! There's Kaz! I was just going to say that I acquired the Zings and it's all Kaz's fault!!! Ahh! I had this and didn't appreciate it... Now I wish I hadn't disposed of it! This one's so pretty, and usually I don't really pay attention to Revlon...well, except for their Streetwear line from back in the day. woohoo!! This is one of my all-time favorites!! I have less than half a bottle and can't bring myself to use it hoping I find a replacement. Love love love it!! It looks like Essence Where is the party! Hey, I have this one! haven't used it in a long time though. Your post made me want to put on Zoya Ki! Yes, more multichromatic polishes would be great. Ozotics makes great ones, but they are expensive and hard to obtain! And I am so lazy to layer them over black. I sooooooo loved this polish! added Sally Hansen's Magic Nails (anyone remember that holo topcoat) to it written the bottle was nearly done. that made my all time FAVE nail color. sadly, it has passed on. Just like The Lifeaholics said... this one really makes me think about the one from Essence: Where is the party. Really. I think I still have this color from when I was in grade school. I was just getting into nail polish then. I have to dig it out of storage. I've never seen this beauty. I do have the Zoya that looks like a dupe. 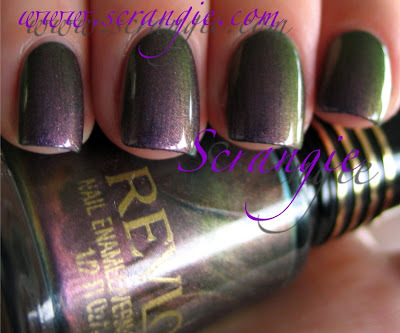 I am not a Revlon fan at all but adore this...wondering if it's an old one out of your stash or still around? I feel lucky to live in a vacation spot where the weather is great even if it's high fog and in the mid 60's some summer days. I am very lucky to live on the Northern Coast of CA. Yes! Multichromes!!!!! I love them! Khaki Zing was such a lemming for me- but I searched and searched- and after a couple of years, I finally gave up. I had forgotten this one! I went through 2.5 bottles of it back in the day...I think it's one of only 2 colors I can think of that I actually used up more than one bottle, lol! I have this color! I found it this past winter at Ocean State Job Lot. If you have one around you, I highly suggest to look for polish's there!! How funny, I still have this, too. The last of the zings. We had RoseZing and MangoZing, I think mango was my favorite. All you people complaining about the hot weather; Texas has been suffering through 100+ for the past month, with no rain. I was up in Indianapolis this weekend, and although humid, the weather was really lovely. Even driving home through Missouri and Arkansas, it wasn't too bad. I had this and omg it's amazing...how did yours last soooooo long?? This was my very first duochrome....and I can't find it in my "old stash" box. I suspect my daughter has swiped it. LOL At least she has great taste! I have begged my husband to let us get our minivan painted in a duochrome color (probably the green-to-purple) but alas, no luck yet!